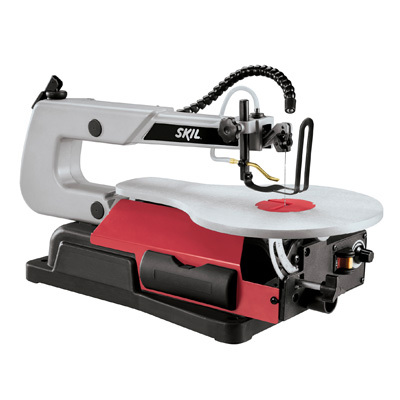 SKIL 16" SCROLL SAW 1.2 Amp motor with electronic variable speed Integrated dust removal system Articulating LED work light Tilting 16" x 10" work table 16" throat Comes with dust port & on-tool blade storage 3335-07 16 IN. 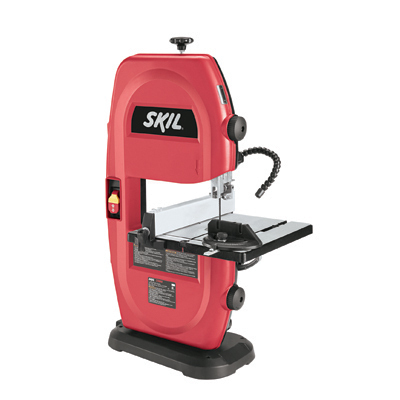 SCROLL SAW SIZE:16"
10" SKIL TABLE SAW WITH STAND Heavy-duty 15 Amp motor 10" table saw Comes with H-D folding stand for fast setup Features self-aligning rip fence - for accurate measurements Capacity 3-1/2" cutting height Comes with 10" carbide tipped saw blade 3410-02 10 IN. 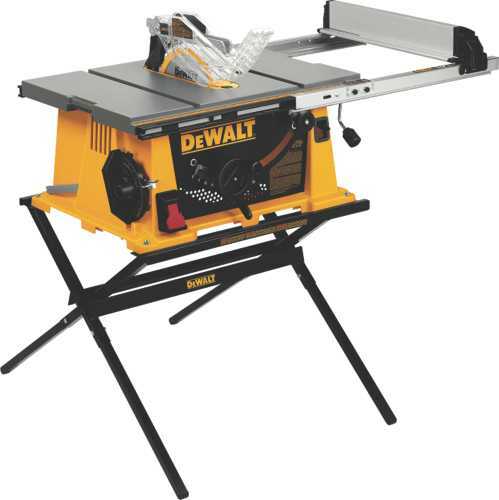 TABLE SAW W/STAND SIZE:10"
SKIL 7" WET TILE SAW Stainless steel top resists corrosion Adjustable rip fence with miter gauge - ensures accurate straight and miter cuts Bevel cuts tile from 0 to 45 degrees Water reservoir keeps blade cool and helps - minimize dust and debris Includes 7" diamond blade and blade guard 3540-02 7 IN. 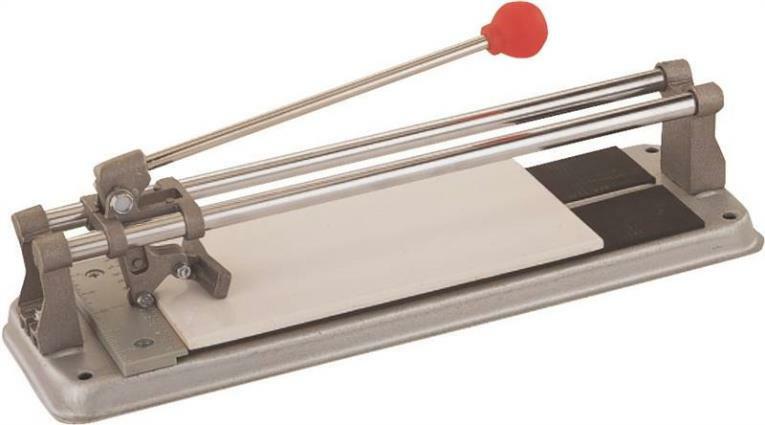 TILE SAW SIZE:7"
Sign Makers Series cuts a variety of material, not just wood. Materials such as aluminum composites, corrugated plastics, foam board, PVC material, wood and much more can now be cut with one machine! We created our Sign Maker's Series to include an accessory package to fit your specialized needs. 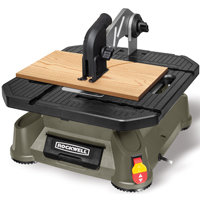 You no longer need to buy a panel saw AND a mat cutter. 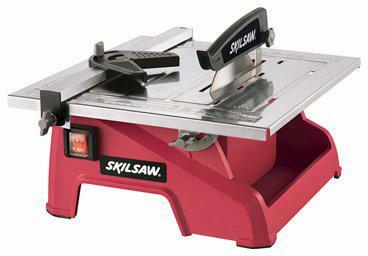 Ideal for sheet goods that are less than 1 3/4 inches thick with precision cuts. 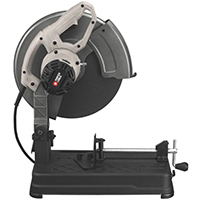 A Makita 5007F circular saw on a spinning saw insert offers ease of use when cutting vertically or horizontally. The best dust collection hook ups possible are provided with this machine. The Folding stand is as easy to open & close as a ladder, yet provides complete stability while in operation. For portability and mobility, transport wheels are included. 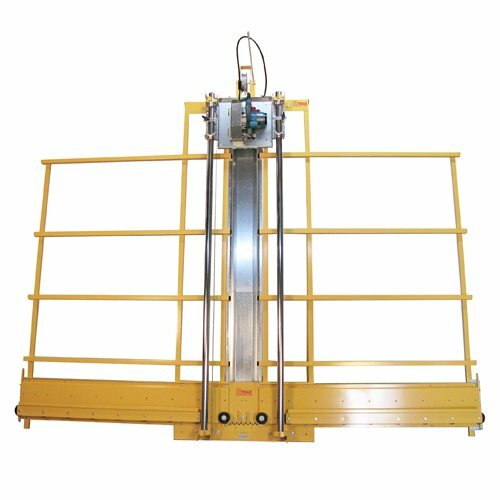 Both the vertical and horizontal measuring systems help to ensure accurate cuts while the stop bar provides the capability to make repetitive cuts. 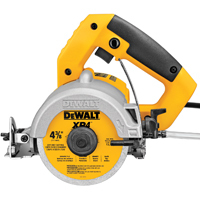 A spring hold down is included to help support thinner material and the Knife cutter insert allows you to cut softer material that would be destroyed by a circular saw. The Compact models are ideal for customers with space constricted shops. This Full Size models are designed to have more material support to provide ease of use when rip cutting. Want to use V groove Dibond? Add our Floating Router Plate. 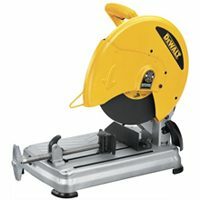 Want to cut Dibond with no saw dust & have smooth edges? Add our ACM Cutter insert. 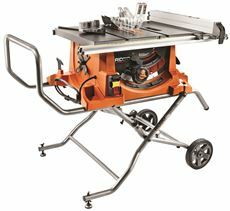 10" JOBSITE TABLE SAW 15 amp saw features 32-1/2" rip capacity Rack & pinion telescoping fence system to make- adjustments fast, smooth and accurate Flip over ripping fence for narrow rip cuts On-board storage for easy accessory access 2-1/2" dust collection port connects to a vacuum 21-7/8" x 26-3/8" table on rolling stand With CT blade-miter gauge-fence-wrenches & guard DWE7491RS 10 IN. 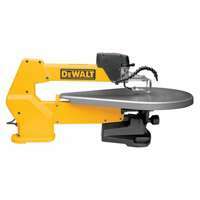 TABLE SAW SIZE:10" COLOR:Yellow/BlackCutting Capacities:3-1/8" @ 90 deg. 2-1/4" @ 45 deg. 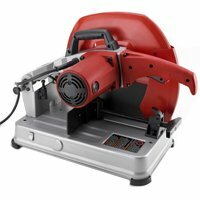 The Varsity & 1000 Series panel saws includes standard features plus an accessory package we would recommend to most wood workers. This series unit is ideal for customers that need to break down sheet goods that are less than 1 3/4 inches thick with precision cuts. 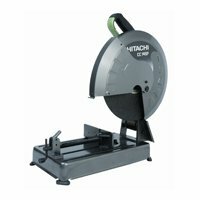 A Makita 5007F circular saw on a spinning saw insert and the best dust collection hook ups possible are provided with this machine. The Folding stand is as easy to open & close as a ladder, yet provides complete stability while in operation. For portability and mobility, transport wheels are included. The unit dimensions are 125"x15"x88"/400 lbs. Both the vertical and horizontal measuring systems help to ensure accurate cuts while the stop bar provides the capability to make repetitive cuts. 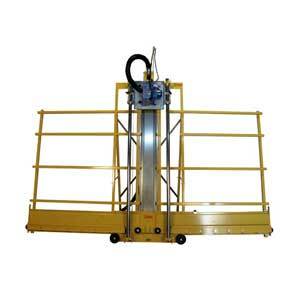 The Compact models are ideal for customers with space constricted shops or need portability. 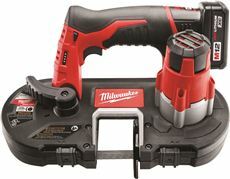 This Full Size models are designed to have more material support to provide ease of use when rip cutting. 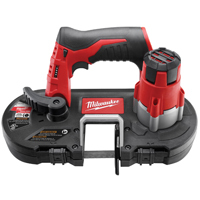 Want to use a router or a utility knife in this unit? Add our Floating Router Plate or our Knife Plate. 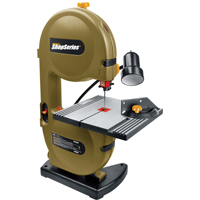 The Classic Series panel saw includes standard features plus a beginner's accessory package we would recommend to most hobbyists. This series unit is ideal for customers that need to break down sheet goods that are less than 1 3/4 inches thick with precision cuts. 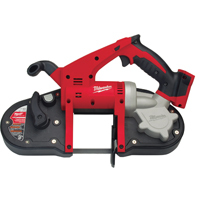 A Makita 5007F circular saw is on a standard saw plate that can be inserted vertically or horizontally. A dust containment hood is provided to control the flow of dust particles. A viewing port on the hood allows the user see where the blade is cutting. 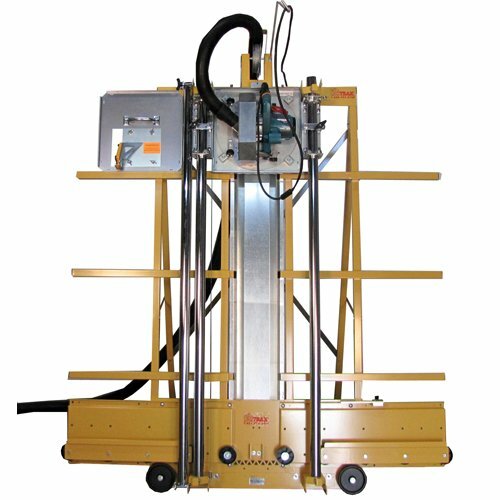 Both the vertical and horizontal measuring systems help to ensure accurate cuts while the stop bar provides the capability to make repetitive cuts. The DW744X 10 In. 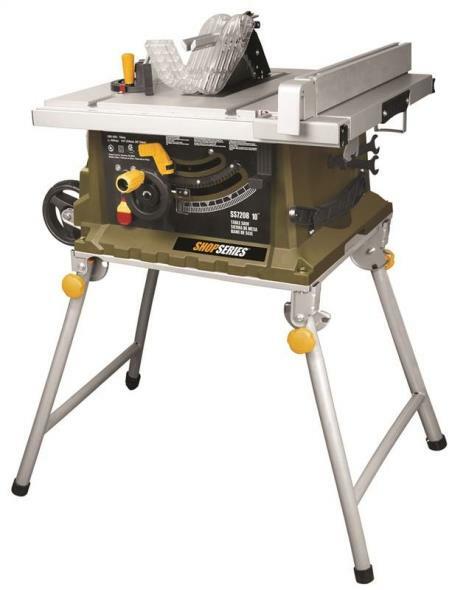 jobsite table saw is the premium jobsite saw in the market, with unparalleled accuracy that comes from the rack & pinion fence adjustment system. 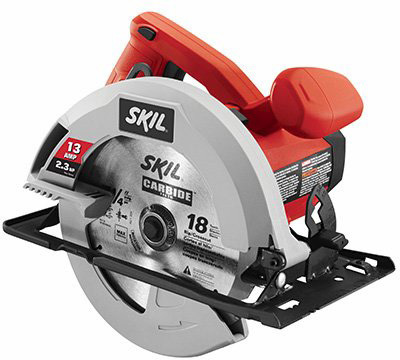 In addition, this saw has plenty of power to power through the hardest woods. 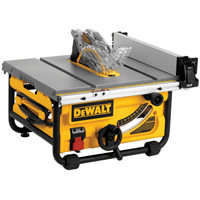 The C4 model packs all of the features of the full-size panel saws into a portable 5' frame. 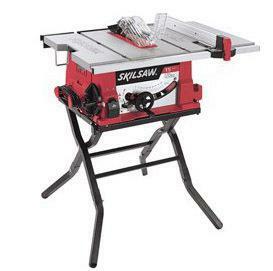 This panel saw can travel to work sites and fit into shops with limited floor space. 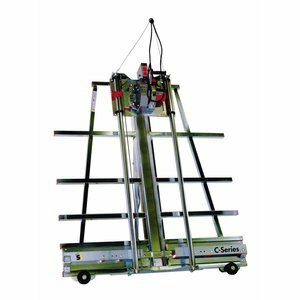 The C4 is ideal for cutting 4'x8' sheets of material. 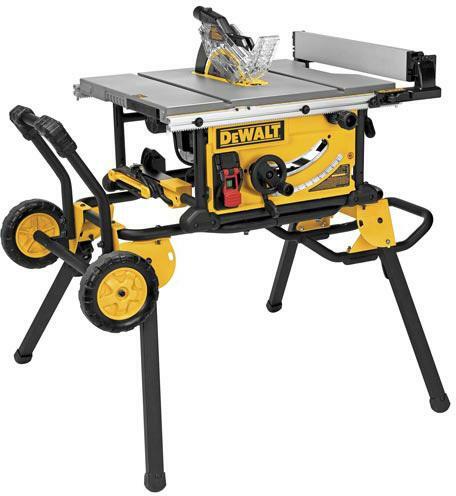 The C4 comes standard with a 3 1/4 Hp, 15 amp industrial duty saw motor, adjustable vertical and horizontal rulers, spring loaded counter balance system, quick change from vertical to horizontal cutting, 1 year parts warranty, and a lifetime frame warranty. 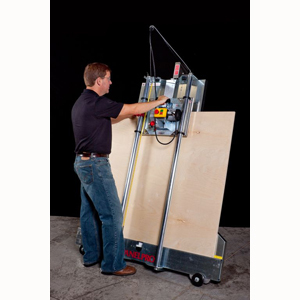 Individual Item Packaged Length: 36"
Individual Item Packaged Width: 60"
Individual Item Packaged Height: 75"
RIDGID� 15-AMP HEAVY-DUTY TABLE SAW WITH STAND, 10 IN. RIDGID� 15-AMP HEAVY-DUTY TABLE SAW WITH STAND, 10 IN. 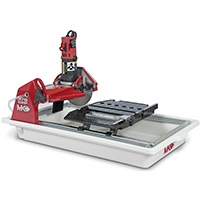 The new Panel Pro (PRO2K) makes it even easier to handle large sheets of material and cut them accurately. The Panel Pro can be easily stored when not in use because it takes up such a small amount of space. The functionality and portability of the Panel Pro means you can take it right to the job site if preferred. One of the hardest jobs in woodworking is cutting a clean 1/8-inch off the edge of a big panel. Panel Pro easily does it without a problem! Rip cutting large panels lengthwise is another difficult job, especially for one person. Because it supports the panel so well, Panel Pro makes this job easy, accurate, and safe. Just plug it into a regular outlet with a 15 amp circuit breaker. 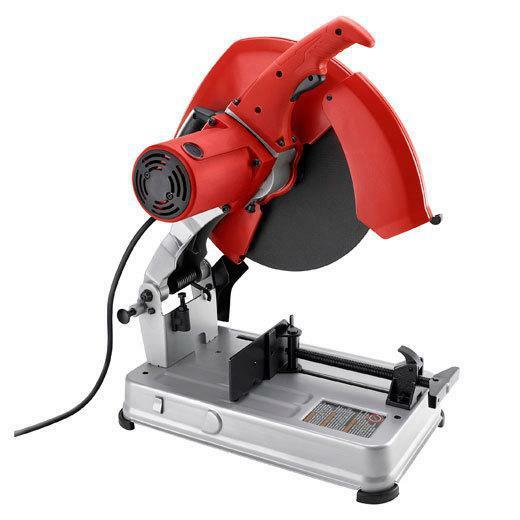 14" ABRASIVE CHOP SAW Powerful 15 Amp-4.0 Amp motor for performance Speeds up to 3900 RPM for fast cutting Durable lightweight (40 lb.) for portability Oversized wheel guards for debris protection 45 degree miter capacity w/adjustable fence 1" spindle with large spindle lock button Comes with quick adjust vise clamp, - 14" abrasive when and hex wrench 6177-20 14 IN. 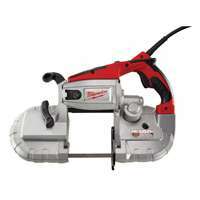 CHOP SAW SIZE:14"